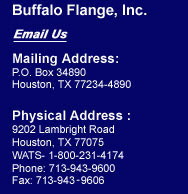 Buffalo Flange is Houston's number one manufacturer and supplier of high-quality speciality, custom and stock flanges. Buffalo Flange knows that to be the best, you have to have the best, which is why all of our flanges are produced by our expert team of steel craftsmen. Buffalo Flange understands that your projects are important and only the best reducing flanges will do. 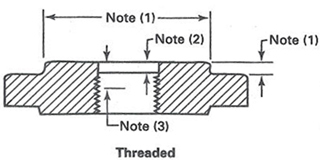 What is a Reducing Flange? 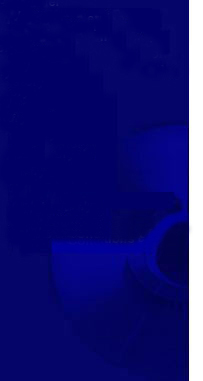 Reducing flanges are a specialty flange that are most often used on projects that require the fitting together of different sized pipes. There are several types of reducing flanges including weld-neck reducing flanges, slip-on reducing flanges and threaded reducing flanges. The number one feature of reducing flanges, is that they are a highly economical way to make transitions between pipes of different sizes. For all your Reducing Flange needs, Email us or call WATS 1-800-231-4174 or 713-943-9600. ©Copyright 2011 Buffalo Flange, Inc.